Settings: Replicator 2 with custom knot slicing/support profile. Technical notes, see previous posts: See Day 110 for the parametric equations that describe this tritangentless trefoil conformation, a link to the paper those equations were found in, and details about the custom slicing profile. See Day 151 for the OpenSCAD code that will generate this knot without the "seam" that appears if you try to model it in Mathematica. 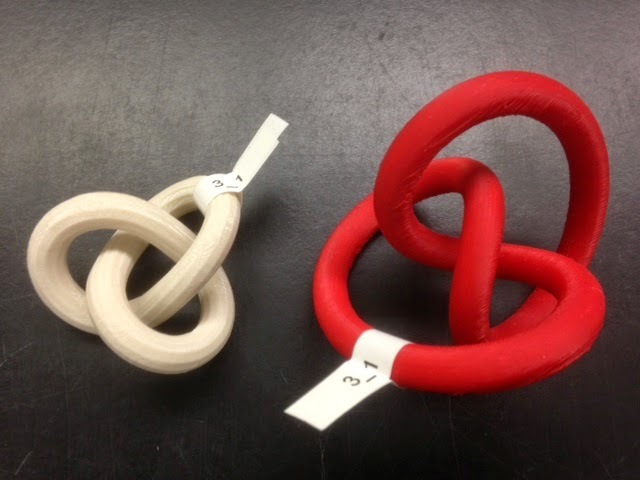 For other interesting conformations of the trefoil see the Trefoil Menagerie on Thingiverse.